Your skin is the largest organ in your body and can become infected with skin diseases caused by yeast and other fungi. The skin protects and holds together all internal structures of the body. It is waterproof yet will absorb certain chemicals. It interacts with the sun to produce vitamin D for use in the body. It releases toxins by evaporation and perspiration as well as cool the body. It will also show much like the teeth the overall condition of your internal system. Your skin can show signs of many skin disease and disorders and can be an early indication that something is seriously wrong in the body. Take for instance acne, psoriasis, eczema, roscea, hives, and dandruff. These are all signs that something is seriously wrong with your internal system. That some kind of toxin is being released by the skin from within the body and the body is trying to cleanse itself of these poisons. Could it be all of these skin conditions be caused by the food we eat and their fungal toxins? Some of the more familiar fungal infections of the skin are jock itch, toenail fungus, and ringworm. 10 to 15% of the world’s population is infected with these systemic yeast infections according to C.C. Kibbler. These fungi come from the soil, plants, human contact, animals, the food we eat, and air conditioning systems. I have actually seen mold growing in air conditioning systems in Las Vegas as well as in the wood in houses. These seemingly harmless fungal infections can have what is called an "id reaction". For example you may have toenail fungus and then break out with a rash somewhere on your body. The rash is not caused by the toenail fungus but by the mycotoxins they release into your bloodstream. The British Medical Journal 1995 found that many people with toenail fungus also had high blood cholesterol. C. C. Kibbler found that people suffering from fungal infections of the lungs also sometimes suffered from skin lesions. Some of these resembling skin cancer! Candida albicans has been found to cause diaper rash or perleche that resembles diaper rash. It also contributes to a host of other systemic yeast infections as well. 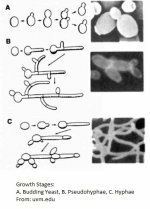 Constantini 1994, in his studies indeed discovered that psoriasis was indeed caused by a systemic yeast infection, fungi, or their poisons they release into the body. Treat the yeast infection and the psoriasis would go away, and this is supposedly an incurable disease. People are having fantastic results clearing skin conditions when nothing else has worked, by following the diet on this website and taking the 11-Strain probiotic powder. Some of these skin infections they've had for years. If you have any questions about the skin diseases listed here or yeast infection in general? Please fill out the form on the contact page.